Apple’s introduction of the various CloudKit APIs within iOS 8 and OS 10.10 Yosemite at this year’s Worldwide Developer Conference was greeted with much glee and excitement from attending developers. The creation of CloudKit will ultimately afford developers with the ability to focus on creating impressive and immersive client-side experiences rather than having to deal with the issues that come attached with server-side cloud storage code. As the APIs are being developed and ironed out it seems that testers will need to put up with some bumps in the road with Apple once again notifying developers that all CloudKit data will once again be wiped at some point today. Early adopter developers who have chosen to get down and dirty with the new CloudKit APIs will surely appreciate that the wiping of any stored data is ultimately part of the roadmap to launch. Today’s deletion of all public CloudKit databases will be the second such occurrence in the time that has followed since the introduction of the technology at WWDC. 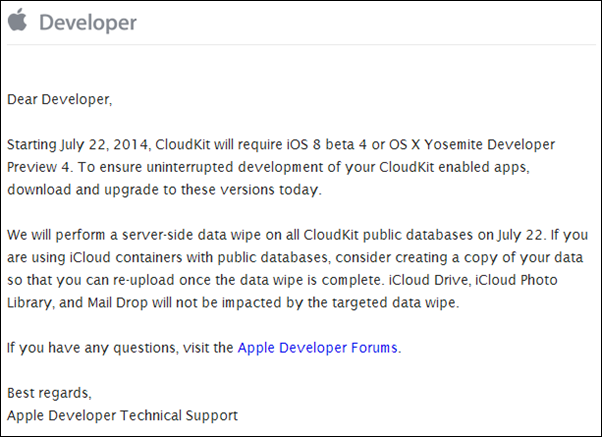 As part of the process of upgrading internal storage servers to work alongside the launch of the latest iOS 8 and Yosemite betas, Apple performed a similar wipe of CloudKit public data back on July 7th. As per Apple’s instructions, if you’re one of the developers tinkering with the new APIs, then make sure you create a copy of any important data that is stored within a public CloudKit database before it’s gone forever.